MK Yuli Edelstien visits Neve Tzuf a year after a terrorist killed three members of the Salomon family. Knesset Speaker Yuli Edelstien spent Shabbat in the terror-stricken village of Neve Tzuf in order to mark a year since a terrorist murdered three members of the Salomon family. 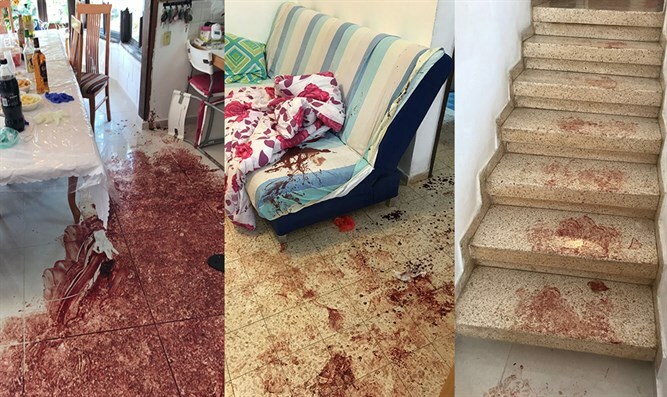 "I spent the weekend with the special residents of Neve Tzuf, on the first anniversary of the terrible murder of the Salomon family, " wrote Edelstein on Facebook. "Our enemies are trying to hurt us from every direction, from the south to the north and center," added Edelstien. "We will not give them. We will do everything in order to preserve the security of our citizens, and no less importantly, on civil cohesion even in difficult moments." "Just as we acted with determination to bring to justice the terrorist who murdered Haya, Elad and Yosef, we will act vigorously against anyone who wants to harm us." On July 21st, 2017, Omar al-Abed entered the town of Neve Tzuf (Halamish) in Binyamin armed with a knife. He broke into the Salomon family home while the members of the family were organizing a "Shalom Zachar" event on the occasion of the grandson's birth. He first stabbed Chaya, 46, the family member who was standing near the door. He then attacked the Chaya's mother, who managed to escape to the second floor, wounded and bleeding. Then he stabbed to death Yosef, 70, Chaya's father, before attacking Yosef's 35-year-old son, Elad, stabbing him to death. Michal, Elad's wife, fled with their five children to the second floor, where they hid. The stabbing spree only ended after a neighbor, who served in a special forces unit, shot the terrorist with his IDF-issued pistol.